elf Golden Bronzer $3- This is a bargain at just $3! It's quite light but that's a good thing, the idea is to look dewy and have a light sheen to my cheekbones, not doused in glitter. I've seen this mentioned a dupe for Dior Amber Diamond. I don't own Dior Amber Diamond, so I cannot agree nor disagree, but for me it applies beautifully for a nice golden sheen. Would definitely recommend this lovely product. elf Eyebrow Kit in Medium $3- Another elf gem! 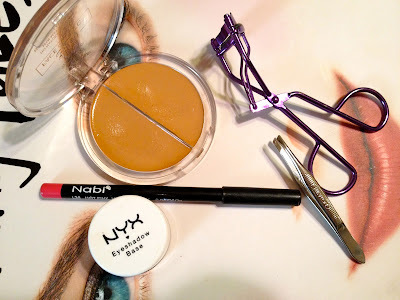 I've used Benefit's eyebrow zing in the past and this is a great (and cheaper) alternative. It has the two pans-one a dark brown wax and a warmer brown powder. It comes with a mini brush that can be used in a pinch. But i prefer to use my MAC angled brush. Ruby Kisses 3D Face Creator in Level 9 $4.99- I use this as a concealer and love that this company caters to women of color (WOC). 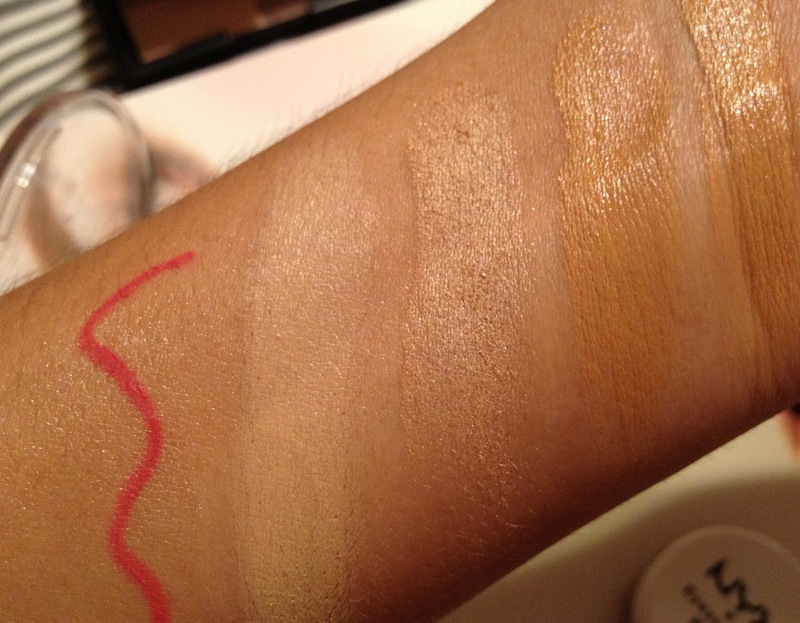 I have a hard time finding drugstore concealers that are my shade. I don't always like the one shade lighter under eye type of coverage-look, sometimes I prefer to have a similar color to my skin tone. This can be mixed and it applies smoothly and does not crease! It feels like silk. A brush would probably make it more neat, but if I'm in a rush a simple swipe with my ring finger is all I need. Jane Cosmetics Oil Free Finishing Powder in Translucent- This has been with me for quite a while (as one can probably tell by the very visible pan! ), I'm guessing I paid under $5 for this. The Jane cosmetics website is under construction (maybe revamping the line?). I've tried several translucent finishing/blot powders but always end up with a white cast, even with a light hand. I can apply a few swipes of this midday or whenever I need a touch up and won't even have to look in a mirror to make sure I don't have a white ashy face! This stuff is great! I really do hope it hasn't been discontinued, it's a great product for a fantastic price. Eco Tools Bronzer Brush $4.99 ($4.99 was Clearance price, regular price is about $9.99, I believe)I found this while browsing Target one day for the awesome price of $4.99!! I love this brush. 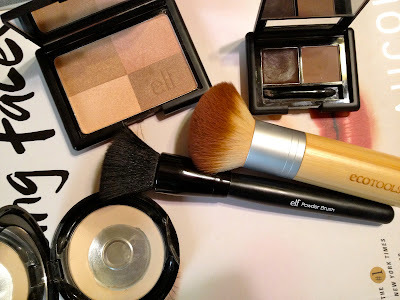 I use it quite a bit-everything from applying my MSFN powder to applying bronzer/blush. I'm definitely going to be adding more of the Eco tools to my collection. elf Studio powder brush $3-This is an amazing brush that gets lots of love on the blogosphere, and with good reason! It has a flat top which works perfectly for applying mineral powder, cream blushes or buffing in your foundation, which is what I use it for. If you don't have this brush-get it!! Purple Eyelash curler $2.80- I purchased this random, no brand name eyelash curler at Forever 21! I usually use the elf brand but it recently broke, picked this up as I liked the lovely purple color, and it works quite nice! Revlon Deluxe Slant Tip Tweezers- I've tried several brands of tweezers-from Tweezerman, elf to Sally Hansen- these are the ones I always go back to. In fact I have two of the same to keep with me and keep one at home. Nabi (L38) Hot Pink Lipliner Pencil $1- I'd never heard of this brand but for the price figured I'd take the chance! This is a great lip pencil-not just because the color is beautiful but because it's soft but not to soft and doesn't tug on my lips! I found this in LA's Fashion District (I could browse all day in Santee Alley). It reminds me of NYX-everything from the packaging to the quality-a very good product for the price. 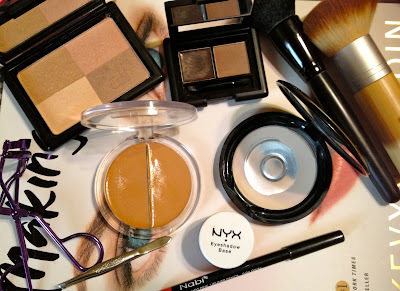 NYX Eyeshadow base Skin Tone- I'm not a huge primer kinda gal, I've only owned a few drugstore brands-elf, wet'n'wild, NYC. But this NYX is pretty good! It goes on smoothly and actually works well. I've not tested it out more than 6 hours but it holds quite well on the nights I've worn it out. The pot has a pretty good amount, so I think this will last me thru the summer!